The best deal is very rarely the cheapest deal. This is something we all understand intuitively. So why are we so easily seduced by unbelievably cheap solar deals that appear so totally believable? Let me be totally up front with you – I did not set up this website, SolarQuotes, as a tool for people to find the absolute cheapest solar power systems on the market. If you want the cheapest solar systems on the market, just type “cheap solar” into Google and click on the Google Ad that promises a 5kW system for $3,000 (At time of writing a quality 5kW installation will cost approx $5,000 – $8,000). It really is that simple. On the other hand, if you use my service, you should get great deals on quality hardware that is installed with care. The prices will be competitive, because the installers are competing with their peers, but I want to be transparent with you. You’ll almost always be able to find a cheaper solar system elsewhere. Many of the companies that advertise these ‘too good to be true’ deals have approached me asking to join the SolarQuotes network. I turn them down. I don’t do this because I am trying to manipulate the market or keep great deals away from my visitors. I do this because I have run SolarQuotes since 2009 with a very simple philosophy: If I would not recommend a company to my grandmother, I will not recommend them through SolarQuotes. You see, while the front-end purchase may be cheaper with these systems, the Chartered Electrical Engineer in me knows that the long-term consequences of buying these stupid-cheap systems is that they end up being more expensive to the buyer in the long run. Looking to get quotes for solar from reputable installers that we’ve hand-picked? Fill out our short form and we’ll arrange 3 free, no-obligation quotes ASAP. While they’re being seduced by the low price, they’re getting sucker punched because they don’t know the ramifications of choosing that cheap option – a low-quality system that will need replacement in a few years, or even a few months in a worst-case scenario. In the end everyone loses. The consumer loses, the industry loses, and the companies with the razor thin margins lose too – because the problem with a race to the bottom of a market is that you might just win. So how do some companies sell systems at such jaw droppingly low headline prices? 1. Bait & Switch. They use quality components as the bait, advertising genuine Tier 1 solar panels and a top end inverter. They put in their conditions of sale that they reserve the right to swap out the inverter and panels for ‘equivalents’. Then, they install a really cheap inverter and panels instead. 2. Bait and Switch V2. They don’t advertise the brand of panels and inverter, just a really low price. When the customer makes an enquiry, they upsell them to better hardware, with the end result that customer pays much, much more than the price that was originally advertised. 5. 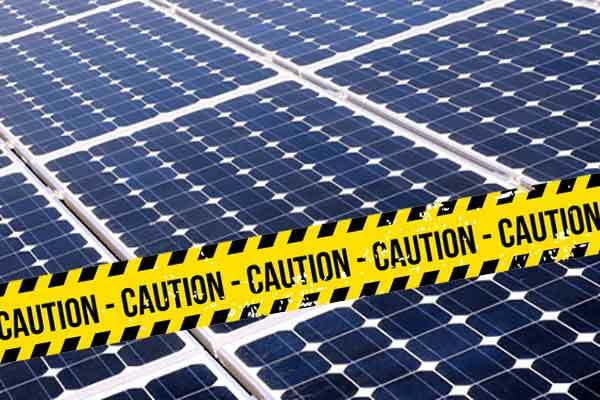 They use crappy solar panels – but claim they are the absolute cream of the crop. Some companies claim their panels are Tier 1, but they are nothing of the sort. Cheap panels do not last in the Aussie sun. Good panels should last 30 years plus. 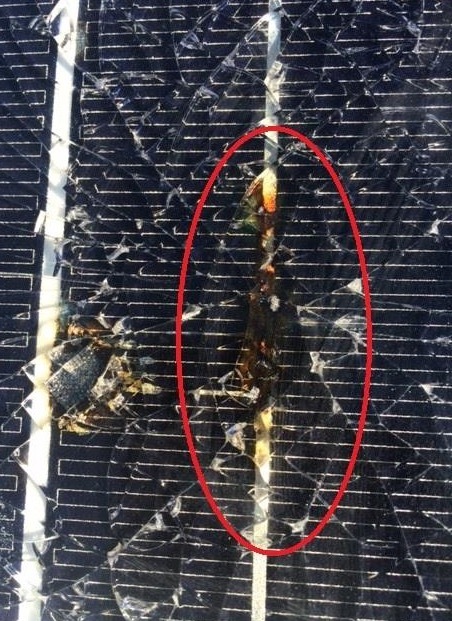 Pictured above: A thermal fracture caused by a hot spot expanding within the panel. 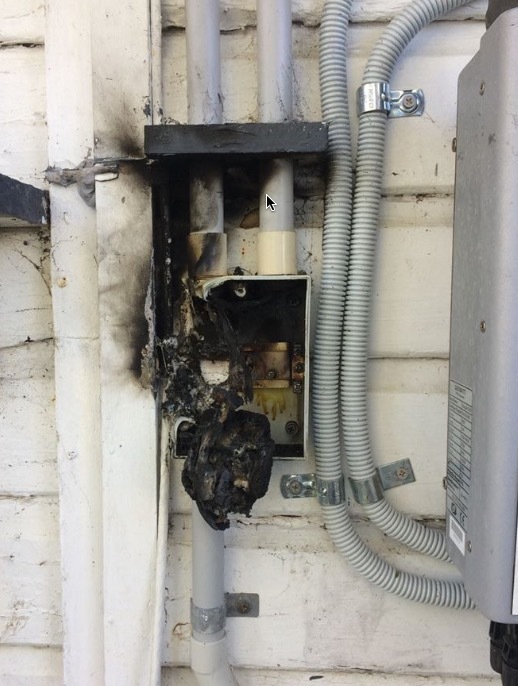 This is what can happen when panels are mishandled or worse still, poorly made. The back of the same panel. 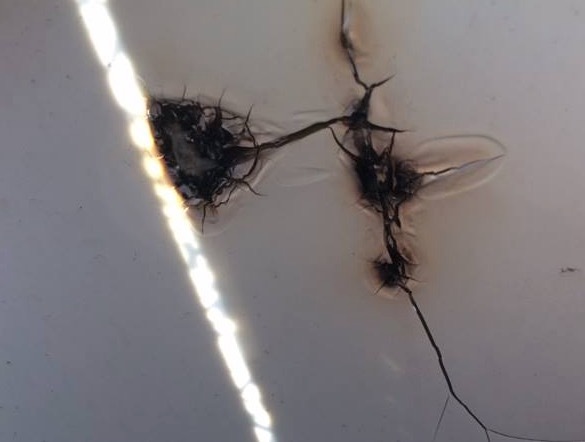 The installer refused to replace it – they claimed it was impact damage. 6. They use a crappy solar inverter and claim it is the best quality money can buy. A really cheap inverter will be unlikely to last 3 years. 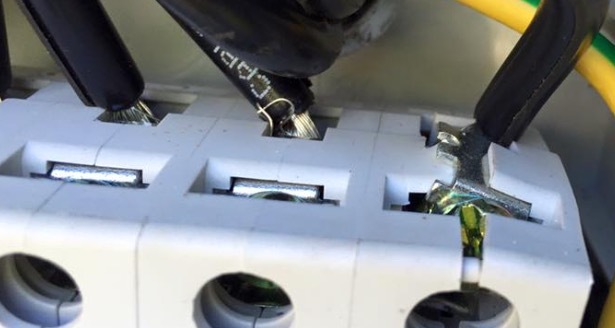 Inverters are easier to replace under warranty than panels, but still some manufacturers will blame the failure on ‘grid spikes’ and you’ll either have to fight, or pay $1500+ for a new inverter. Hey, inverter manufacturers! If you want to sell into the Aussie market, then you have to cope with grid spikes because our grid voltages are all over the place! 7. They hire commission only salespeople, treat them like crap and fire them if they don’t reach their quotas. If the salesperson you let into your home is under constant threat of being fired, do you think they might be more likely to oversell the benefits, exaggerate the quality and push for the sale there and then? Of course. These guys are under the pump. 8. They turn crap quality solar panels into an opportunity to make even more money. There is a loophole in the solar rebate. You can replace all the panels on someone’s roof and claim the rebate again! The rebate is worth over $600 per kW installed. A really cheap panel can be bought for under $500 per kW. Do the maths! I could go on and on – but I’m starting to get depressed! Then please be wary of the ‘too good to be true’ offers online, in the papers and on TV. All the information you need to make an informed choice is on this website, and you are absolutely welcome to contact me if you need any help, whether you got your quotes through this site or elsewhere. I’m a Chartered Electrical Engineer, Solar and Energy Efficiency nut, dad, and founder of SolarQuotes.com.au. My last “real job” was working for the CSIRO in their renewable energy division. Since 2009 over 270,000 Australians have used my site to get quotes for high quality solar from pre-vetted solar installers.